Interview with Shannon McFerran Australian Women's Football League player. “Your body is a temple and you really need to look after it, that’s probably one of the really strong things got out of it. I’m also really thankful for the people around me, I guess you can take those people for granted.” Sharon McFerran. Shannon McFerran has ridden extreme highs and devastating lows. 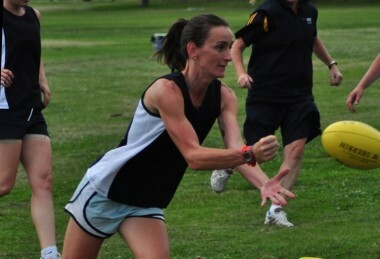 She is the best female Australian rules footballer of all time. OF. ALL.TIME. A spectacular achievement in a game she adores. But it’s not just her on field talent which has won her admirers. Just before her thirtieth birthday McFerran was diagnosed with a brain tumour. She had gradually lost hearing in her left ear over a ten-year period so she went to a specialist. The specialist diagnosed an acoustic neuroma. Rather than crash in a heap, she played the season out and earned All Australian women’s captaincy. The secondary teacher had the benign tumour removed and was forced to miss the 2010 season, her comeback, skill and attitude earning her a spot in the top 100 Australian Sportswomen of all time. Martine Harte: Shannon can you take us back to when you first made your mind up to play? At what age did you pick up a footy? Shannon McFerran: As a 7 or 8-year-old, my older brother played football so he used to drag me out the front to have a kick, I went to most of his training and games. Mum said, “well you’re here every week you may as well join in.” So I ended up playing under 9’s and it went from there. So where to from there? Shannon McFerran: Girls couldn’t play after the age of 12 – this was before the youth girls competition was brought in – I really loved it … so I took up umpiring and starting umpiring for the boundary and the field for juniors. Then I heard about a women’s league when I was 17, that was very exciting! I asked my parents if I could play and initially the answer was no. I was only a little, tiny, skinny thing back then so I think dad thought I’d end up getting hurt. A few tears and a little bit of coaxing later I was having a kick and yeah have been playing ever since. The Victorian women’s football league has increased massively, more than 200 per cent in last three years – great stuff – why is that? Shannon McFerran: It’s amazing and due to the hard work of the people involved behind the scenes, and also to the youth girls competition because before that obviously the girls couldn’t play with the boys so it made it very hard. You were hit with a real curve-ball at the end of the 2009 season, what happened? Shannon McFerran: I had a gradual hearing loss in my left ear, it spanned ten years. I went back to have a hearing test and the audiologist referred me on an ENT. (ear, nose and throat specialist) The one I went to gave me an MRI and picked up the acoustic neuroma which was the cause of the hearing loss. It’s one of those small growing tumours, obviously a benign tumour so you can choose to leave it or have radiation to shrink it, or have it removed. At the time I was young, fit and healthy and thought let’s get rid of this thing! It was a big operation, it went for five hours. I had a nice haircut, 26 staples in my head to get that little sucker out. Something like that sort of keeps things in perspective, I thought there are things that I need to do. One of those was have kids, so that was important to me and yeah I haven’t looked back, so although I can’t hear in one ear, it’s been good. How else did it change your perspective? Shannon McFerran: Coming back into footy after that, I didn’t take it for granted and wanted to really enjoy the team I was playing with, people around me and my body. Your body is a temple and you really need to look after it, that’s probably one of the really strong things got out of it. I’m also really thankful for the people around me, I guess you can take those people for granted. You need extraordinary endurance to finish four quarters of a footy match can you tell us about a time when your body wanted to pack it in? Shannon McFerran: The women’s national championships are week-long events. The games are shorter but the intensity is so much higher. I remember in WA a few years back we played the final against WA at Subiaco and after playing 4 games of footy during the week it is hard to get yourself up mentally and physically. Subiaco isn’t a small ground and I was “knackered” but to be honest once the siren goes and the adrenalin kicks in even in the last quarter when you look up at the scoreboard and see you are in front you just seem to find something to help you push through and that’s when you know all the training has paid off. So in that instance what does Shannon McFerran tell herself? Shannon McFerran: Keep running!! When you play footy grand final or sporting final you know there is no next week so I tend to just be in the moment. You seem like a very positive person to me, is that who you are all the time? Shannon McFerran:I like to be positive and stay focused, my mum and dad have always said that once I get an idea in my head I won’t let go until I accomplish the idea or get what I want and it’s hard to do that without staying positive and setting goals. You mentioned you put on 40 kilos during your pregnancy with your twin boys, I know there will be women reading this, going through something similar. (NOTE: This is not a trashy magazine ‘lose your baby weight in 24 hours’ thing) But do you have any realistic advice for women who may want reclaim their fitness and feel comfortable in their own bodies? 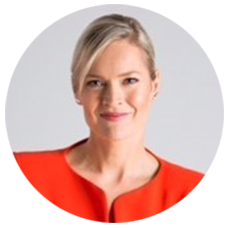 Shannon McFerran: I did put on 40 kg with my twin boys and perhaps when my obstetrician said, “be careful you don’t put on too much weight as it’s hard to lose later,” I should have listened a little more carefully, but being my first pregnancy I had no idea what to expect. I wasn’t a big eater before I was pregnant but I certainly found my appetite while I was. I think it’s important to make good food choices but if all that’s too late, then hit the pavement (with bubs of course)! Once I was able to start exercising I did, I started small and then built up, I remember struggling to run around the block, and for someone who loves running it wasn’t pretty. But I set small goals and stayed focused. Like they say, it took 9 months to put on, so take your time, when you’re ready and more importantly when your body is ready it will let you know! What is the most important thing you will teach your boys in relation to respecting women? Shannon McFerran: I hope I never have to teach them anything about having to respect women, for me it would be a non-issue, but if I had to say one thing it would be that we all are who we are and we should respect everyone for their beliefs, gender and sexuality. Tagged in overcoming adversity, post baby body, women's football league.